I apologize as I am slightly behind with my blogging over the last couple days, but am slowly catching up!! 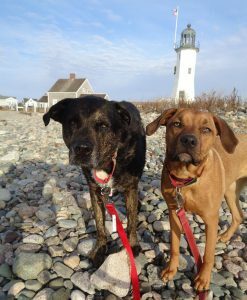 On February 18, 2019 Shadow, Wilma, My Mom, and I Adventured to the Two Lights State Park in Cape Elizabeth, Maine. Two Lights State Park is a 41 acre Park that provides stunning coastal views of the Casco Bay and the Atlantic Ocean. Unlike the name suggests there are no lighthouses directly in the Park, however the Park obtained its name from the nearby “twin” Lighthouses. Two Light State Park is well known for the spectacular rocky shores, and is popular for picnicking and strolls along the shoreline trails. We have enjoyed three separate Adventures to the Two Lights State Park. Two Lights State Park has a special place in our hearts as it was the first stop my Mom and I made when we began our outdoor getaways with the dogs. Our first visit occurred with Buster and Shadow on a very rainy September day. However we still carried on, getting soaked along the way. We took our first selfie EVER, the beginning of a new tradition which would capture memories, and landmarks throughout our future journeys. On this visit I remember especially enjoying the shoreline trail, the rocky shores, beautiful flowers, and of course the overall experience and memories made. On February 18, 2019 we had our third Adventure to Two Lights State Park on a super-cold day. We debated a visit due to the frigid weather but were eager to check out the location in the snow. It was lovely walking around in the snow, on as we viewed the coastal scenes. I slipped several times, but officially managed to stay on my feet. We especially enjoyed some snow covered steps along the trails, and the snow covered rocky shores. This was our second visit during the month of February with Shadow and Wilma, however the first in the snow. Definitely an appealing oceanfront Adventure to the Two Lights State Park (Rating: 4).